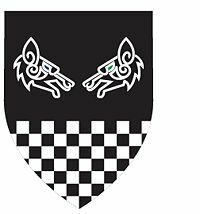 Sable, two wolf's heads couped close respectant argent, a base checky sable and argent and for augmentation, on a sinister canton Or a tyger rampant azure. 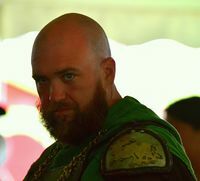 Syr Brennan mac Fearghus is a Knight and a warrior/unit commander for Duchy Von Drachenklaue within the Northern Army. He served three times as King of the East alongside his beloved wife, Caoilfhionn inghean Fhaoláin Dux. Syr Brennan enjoys long walks on the beach, sunsets, pina coladas, and getting caught working reigns. Just kidding. He enjoys hitting his friends with sticks and watching excellent displays of all martial pursuits. We all know he couldn’t art, but he is amazed by the incredible talent of Eastern artisans. He is also willing to try many different pursuits with exceedingly patient teachers. He is the scribal student of Christiana Crane. He would like to think he is proof that there is a thing for each of us if we just keep plugging. One of these days, Brennan will settle down and get a fully grown persona. In the interim, he enjoys portrayals of Justinian-era Byzantine in the style of his line, Roman portrayals as honors Caoilfhionn, or Viking portrayals in the style of much of his household. ...whatever the Crown wishes. Also, please coordinate with Caoilfhionn Dux.